Living in New England, February is a garbage month. You're just want winter to finally be over, but it's a miserable, cold, wet month. 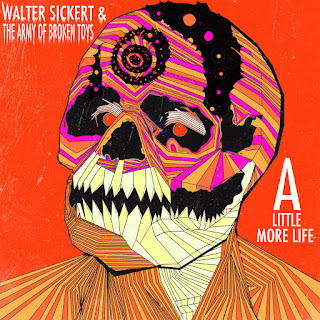 There are only two days to look forward to: The 15th when Valentine's Day candy goes on sale, and the 28th when our favorite punk/folk/burlesque/rock/steamcrunk band Walter Sickert & The Army of Broken Toys release their entry for the RPM Challenge. This year brings us A Little More Life. For the most part, the Army of Toys' RPM Challenge releases tend to be more mellow than their official albums. As much as I enjoy them, I have a preference for their songs with a little more oomph. A Little More Life is no exception, but the more quiet songs are gorgeous, which I don't believe is a word I've ever used to describe their music before. Album opener, "A LITTLE MORE DEATH," is one of the most lush songs I've heard in a while. "KING CLONE" has a little R&B and hip hop edge to it. The album picks up a bit with "CHILDREN OF THE HYDRA," which features a reworked verse of Doug E Fresh & Slick Rick's "La Di Da Di" specific to the Army of Toys. I know I'm getting older, since "EMPTY NOW," a duet between Walter Sickert and Wednesday Alice (his daughter with Edrie), might be the sweetest song I've ever heard. This is by far my favorite of their RPM Challenge albums to date. You can listen to "CHILDREN OF THE HYDRA" below. A Little More Life is available for free via Walter Sickert & The Army of Broken Toys' Bandcamp. If you do download the album, try to throw the band a few bucks or at least give them a follow on social media. You can find them on Facebook and Twitter.